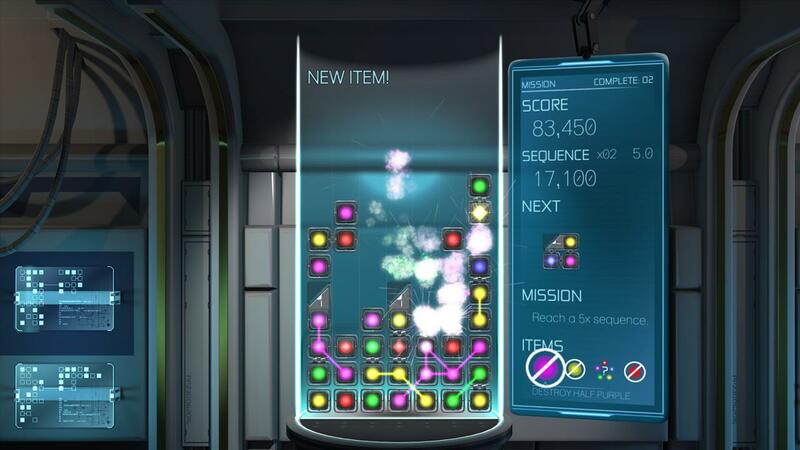 Let’s just get it out of the way and acknowledge the elephant in the room: Anode is Tetris 2.0, and there’s nothing wrong with that. Tetris is so old now that it’s practically a genre more than an actual game, and I am not knocking Anode for being so similar to it in the slightest, but it is important to accept this truth and move on so we can talk about the game before us and not the game behind us. 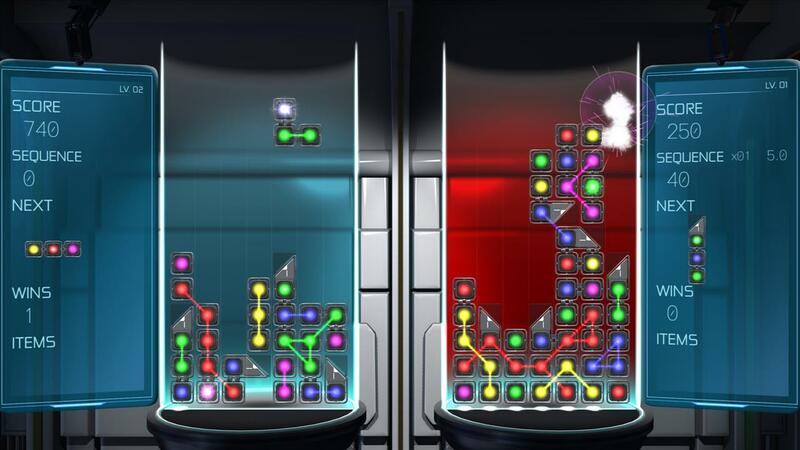 And, as Tetris clones go, Anode is really good. It’s immediately familiar in a comfortable way, but without question has enough of a spin on the genre to carve out its own identity. When games get this minimalistic, a lot of the appeal comes down to the way the game presents itself. Anode has a nice sleek sci-fi theme and cool color palate that won’t wear down your senses as you stare intently at the screen. The music is sort of standard, which is a bit of a shame; sci-fi games typically lend themselves well to good soundtracks. Most importantly, though, is that Anode is not distracting or unpleasant. 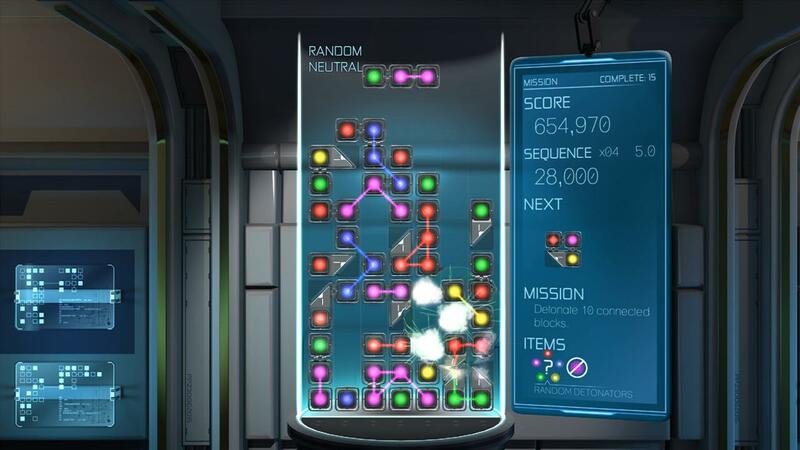 So what is Anode’s spin on the Tetris formula? You’ve still got the colorful blocks dropping down slowly from the top of the screen, with different shapes and colors that need to match up to clear space. The interesting mechanic with Anode is that the blocks don’t get cleared until you get a specific glowing block, called a Detonator. 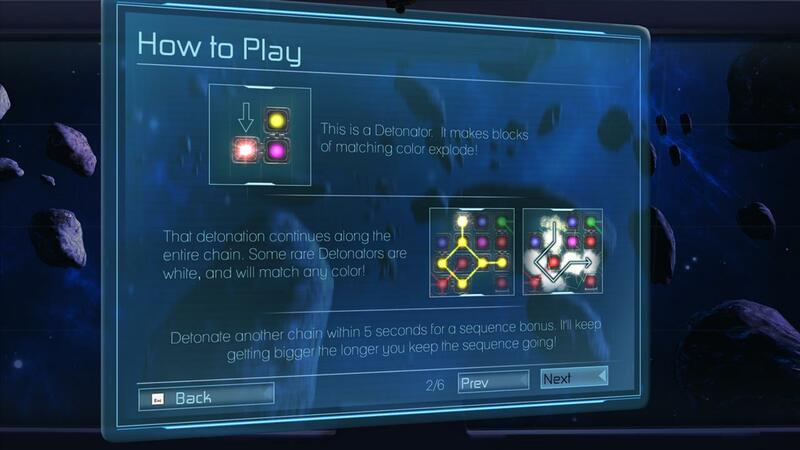 When the detonator connects to a chain of the same color, the entire chain is detonated. This adds a surprise amount of suspense and strategy to the experience. Sometimes it is better to hold off on detonating a chain and wait until you can get a really good combo, and other times it’s best to just clear space right away. These colors can be connected by a block called a Coupler. The coupler will essentially link two different colors together, and then when one of the colors is detonated, the chain continues through the connector into the second color chain. The couplers can only be connected at a specific angle, and it can sometimes be risky to try to connect chains. Again, it adds a surprising amount of depth. If you detonate a chain of more than seven blocks, you get an item. The items can be used at any time, and do things like destroy half of a certain color, destroy the bottom row, or make the descending block hover for a while so you can better plan your next move. The items can help get you out of a tight spot and keep the game going when all seems lost, and can keep the games going long enough that they stay interesting. There are four different game modes in Anode. The default is Endless, which is your standard play-until-you-lose mode, and the other three unfortunately aren’t that interesting. “Mission” has you play the game as normal, but has a series of challenges for you to complete, such as getting a certain chain length. “Time Attack” has you trying to last until the timer runs out, but the timer only goes up to six minutes so it’s never a challenge at all. 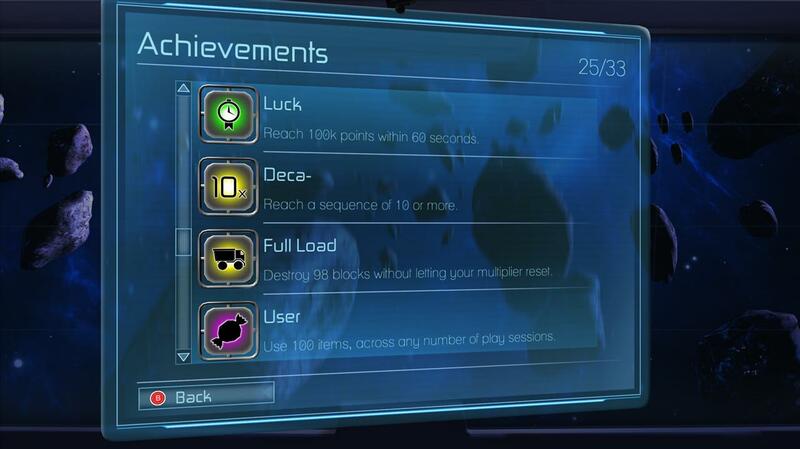 “Race” sets a specific score for you to reach, and you have to reach it as fast as possible. Aside from “Mission,” the game modes don’t really affect the way the game plays at all and don’t add much of anything to the experience. There’s also multiplayer, but once again, there is no online multiplayer. I don’t know why this seems to keep happening with these little indie games; no game in 2016 should have local multiplayer only. If you’re dying to play a Tetris-esque game with someone on the same TV, then here’s your chance, I guess, but I can’t help but wonder why there’s no online component. Anode is pretty fun. It only costs $3.99, and that’s probably about what it’s worth. It’s a very small game designed to be played in bursts of maybe 45 minutes or an hour, but I was surprised by how much fun I had with it. It occupies a weird space in the gaming world, one that doesn’t feel like it really belongs on consoles, but for what it is, it’s a perfectly enjoyable, and offers just enough originality in its take on the formula to be worth your attention. 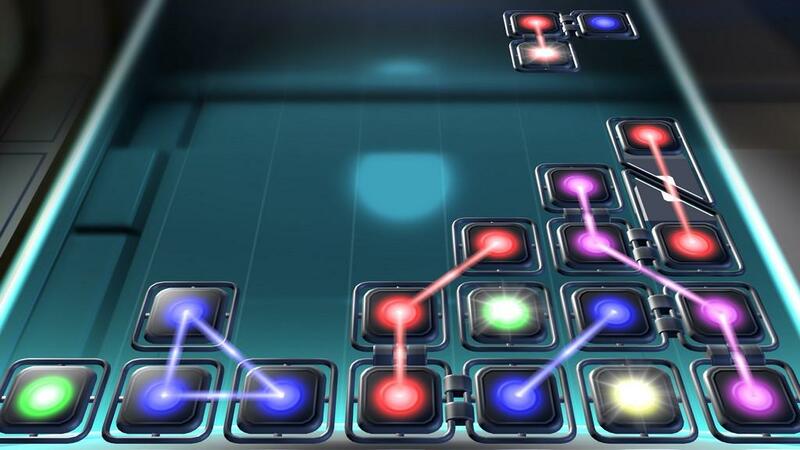 For such a low price, Anode is just interesting enough to be a worthwhile take on a puzzle game formula.